Chartres Cathedral, also known as the Cathedral of Our Lady of Chartres, is a medieval Catholic cathedral of the Latin Church located in the medieval town of Chartres about 80 kilometers southwest of Paris. 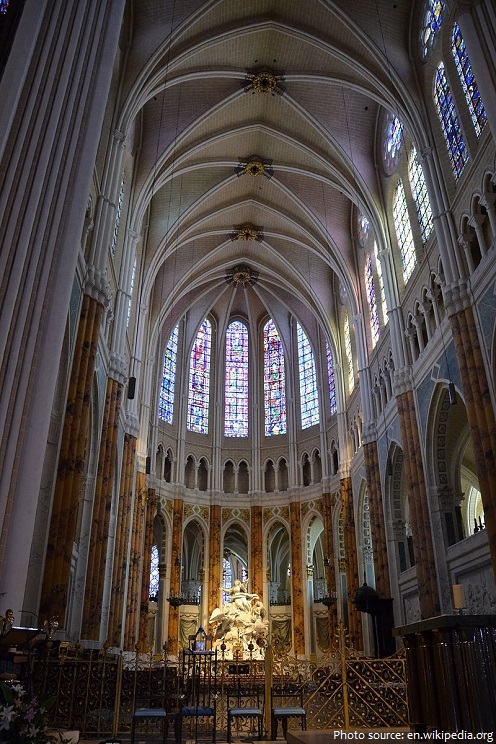 Not only is Chartres Cathedral one of the greatest achievements in the history of architecture, it is almost perfectly preserved in its original design and details. 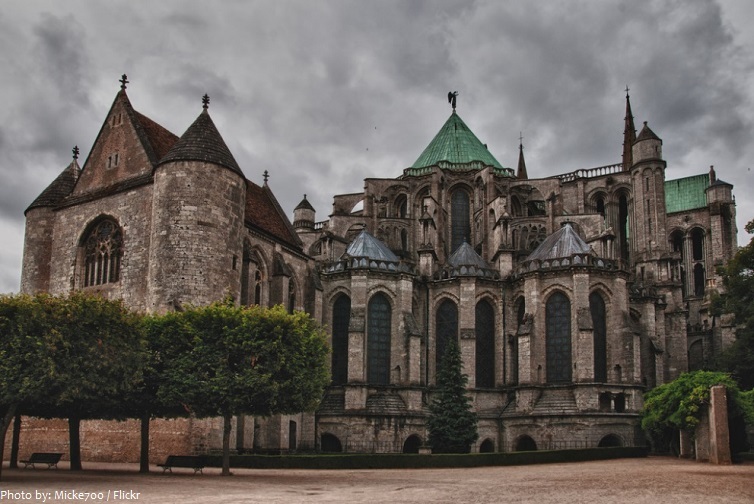 Partly built under the direction of Bishop Fulbert of Chartres starting in 1145, and then reconstructed over a 26-year period after the fire of 1194, Chartres Cathedral marks the high point of French Gothic art. From a distance it seems to hover in mid-air above waving fields of wheat, and it is only when the visitor draws closer that the city comes into view, clustering around the hill on which the cathedral stands. 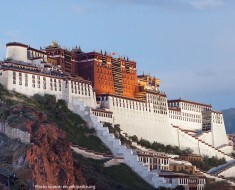 It is built of limestone and stands some 37 meters (121 feet) high, 130 meters (430 feet) long and 32 meters (105 feet) to 46 meters (151 feet) wide. 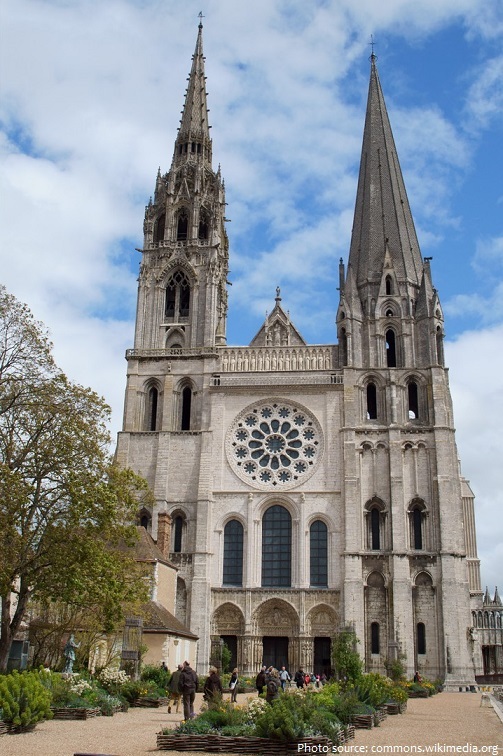 The only aspect detracting from Chartres Cathedral’s elegant symmetry are the mismatched west spires. 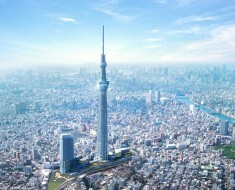 The south spire is a 105-meter (349-foot) plain Romanesque pyramid dating from the 1140s, while the north is a 113-meter (377 feet) early 16th-century Flamboyant Gothic spire on top of an older tower. 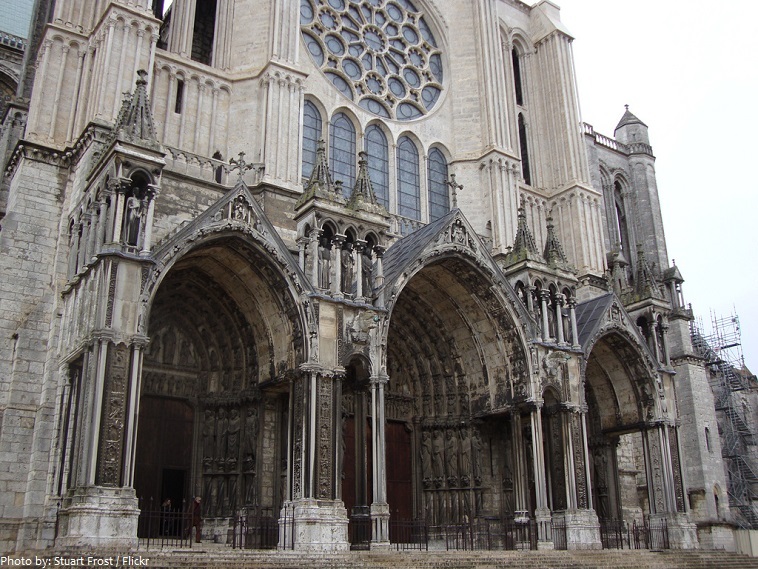 The cathedral has three great façades, each equipped with three portals, opening into the nave from the west and into the transepts from north and south. The sculptures on the west façade depict Christ’s ascension into heaven, episodes from his life, saints, apostles, Christ in the lap of Mary, and other religious scenes. Below the religious figures are statues of kings and queens, which is the reason why this entrance is known as the ‘royal’ portal. The north transept portals illustrates the Old Testament and the Virgin Mary as precursors and preparations for Christ. The overall iconographical themes are clearly laid-out; the glorification of Mary in the center, the incarnation of her son on the left and Old Testament prefigurations and prophecies on the right. 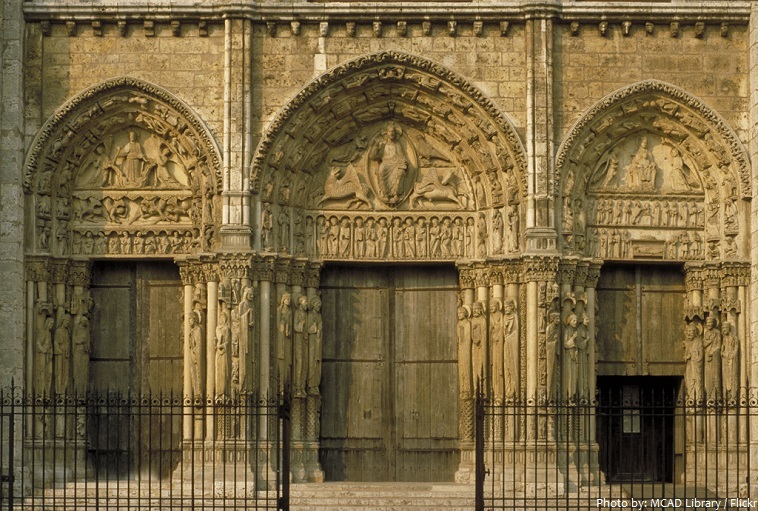 If the north portals are all about the time leading up to Christ’s incarnation and the west façade is about the events of his life and Passion, then the iconography of the south transept portals addresses the time from Christ’s death until his Second Coming. The central portal concentrates on the Last Judgement and the Apostles, the left portal on the lives of martyrs and the right on confessor saints. The building’s exterior also has flying buttresses (arc-boutant, arch buttress) which allowed the architects to increase the window size significantly. 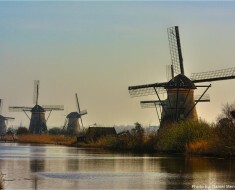 Even the elegance of the exterior does not prepare the visitor for the wonders that lie within. 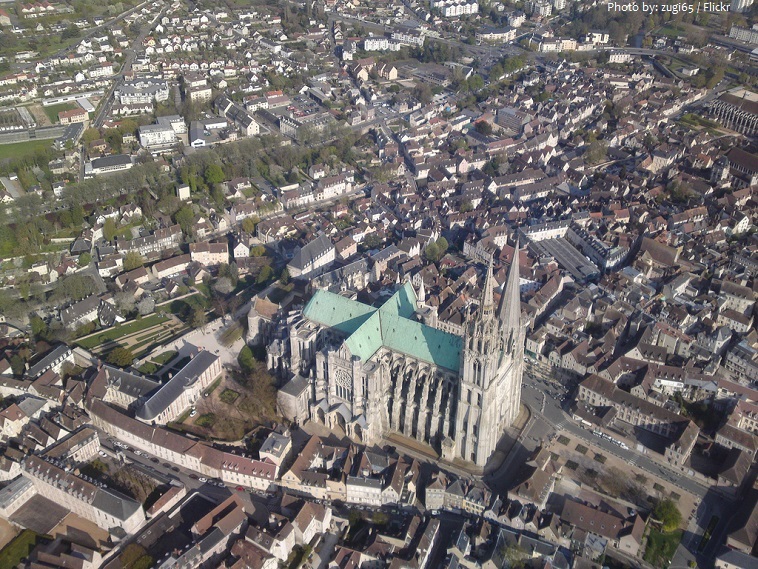 Chartres Cathedral is built on a cruciform plan. 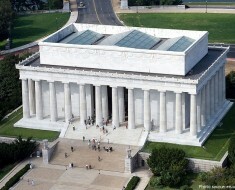 The nave, 16.4 meters (54 feet) wide and 44 meters (144 feet) long, consists of seven bays punctuated by as many columns. The vaults of the central nave are 37 meters (121 feet) high in the nave. Clustered columns rise dramatically from plain bases to the high pointed arches of the ceiling, directing the eye to the massive clerestory windows in the apse. At the east end, an ambulatory wraps around the choir and sanctuary, dramatically vaulted and divided from the latter by a magnificently carved choir screen. 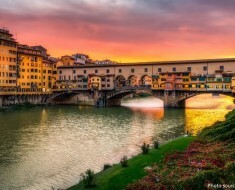 It was erected in the 16th century and its sculptures were gradually added over a long period between the 16th and 18th centuries. The choir contains 200 sculptures in 41 scenes. The sculptures depict scenes from the lives of Christ and the Virgin Mary. 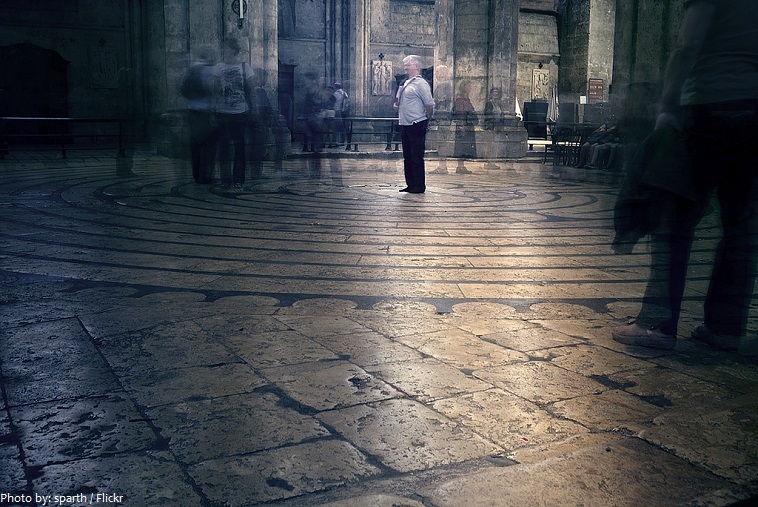 The stone floor still bears its ancient floor labyrinth (1205), used for walking contemplation by monks and still used for meditation by pilgrims. There is just one path through the labyrinth and it is 964 feet long. 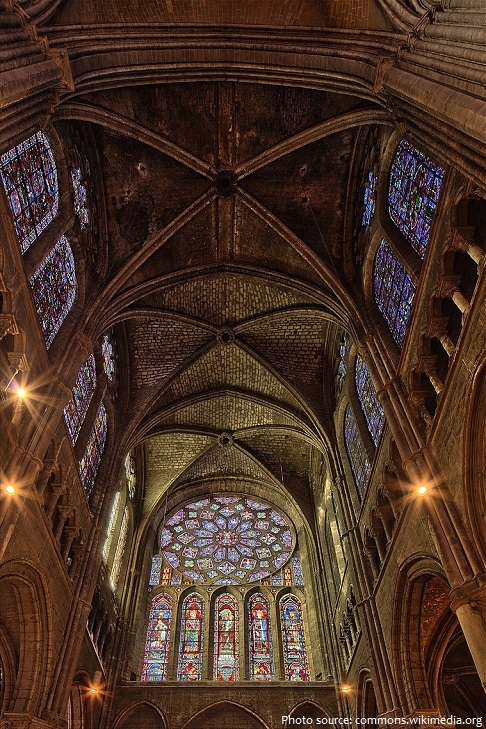 Perhaps the most distinctive feature of Chartres Cathedral is the extent to which architectural structure has been adapted to meet the needs of stained glass. 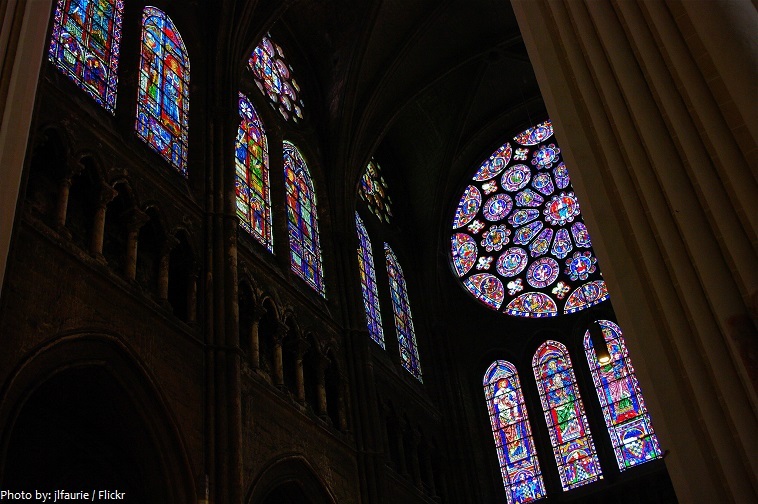 There are 176 stained-glass windows. 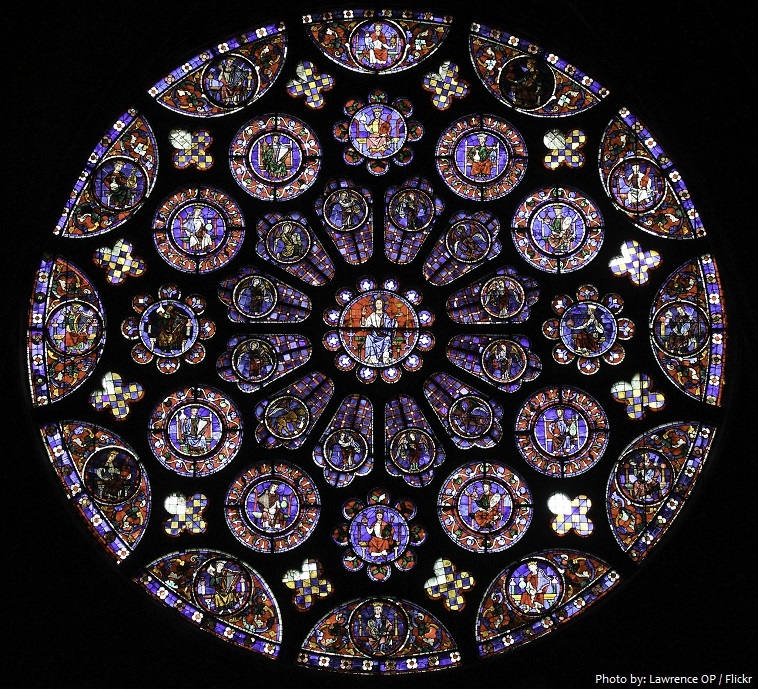 Dating from the early 13th century, Chartres Cathedral’s glass largely escaped harm during the religious wars of the 16th century; it is said to constitute one of the most complete collections of medieval stained glass in the world. The cathedral has three large rose windows. 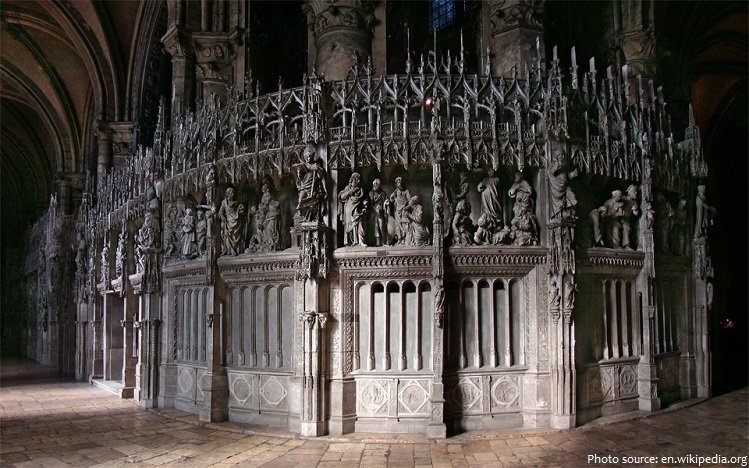 The western rose, made c.1215 and 12 meters (39.5 feet) in diameter shows the Last Judgement – a traditional theme for west façades; The north transept rose 10.5 meters (35.5 feet) diameter, made c.1235), like much of the sculpture in the north porch beneath it, is dedicated to the Virgin; The south transept rose [photo below] (10.5 meters (35.5 feet) diameter, made c.1225–30) is dedicated to Christ, who is shown in the central oculus, right hand raised in benediction, surrounded by adoring angels. 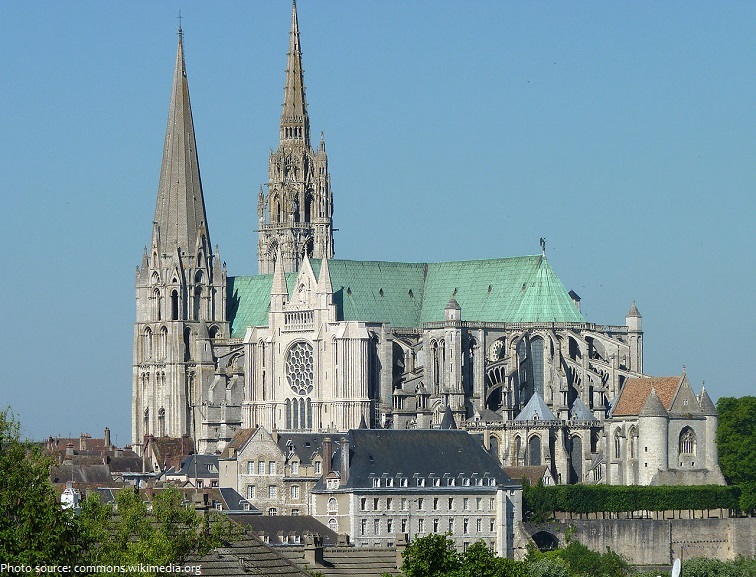 Chartres Cathedral is designated a World Heritage Site by UNESCO, which calls it “the high point of French Gothic art” and a “masterpiece”. Since at least the 12th century the cathedral has been an important destination for travellers – and remains so to the present, attracting large numbers of Christian pilgrims, many of whom come to venerate its famous relic, the Sancta Camisa, said to be the tunic worn by the Virgin Mary at Christ’s birth, as well as large numbers of secular tourists who come to admire the cathedral’s architecture and historical merit. Orson Welles famously used Chartres as a visual backdrop and inspiration for a montage sequence in his film F For Fake. Welles’ semi-autobiographical narration spoke to the power of art in culture and how the work itself may be more important than the identity of its creators.